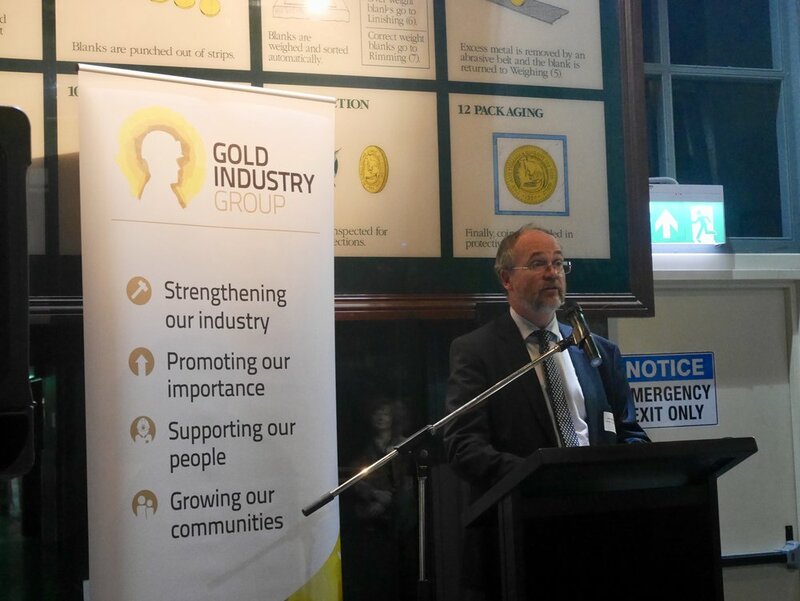 More than 100 members and industry colleagues attended last month’s annual networking event at the historic Perth Mint, to discuss the future of gold mining in Australia with special guest the Hon. Bill Johnston MLA. Minister for Mines and Petroleum, Hon. Bill Johnston, providing an address at the GIG Sundowner. Now in its third year, the event provides a golden opportunity for members and industry colleagues to form connections, build on existing relations and stay up to date on the latest workings of the Gold Industry Group (GIG). The evening’s speeches began with the Gold Industry Group Chairperson and Perth Mint Chief Executive Officer Richard Hayes, who warmly welcomed the GIG’s newest members: Silver Lake Resources, Evolution Mining, St Barbara Limited, Newmont, AngloGold Ashanti Australia, Newcrest Mining, KCGM, Swick Mining and Earth Science WA. In his welcome address, Hayes looked back over the year that was, recapping important industry developments whilst also announcing the GIG’s upcoming events and projects for the rest of 2018. "I am looking forward to the year ahead as we embark on new initiatives and seek to support State and national programs which will benefit and engage the wider community," said Richard Hayes. Hayes continued with a special mention of the upcoming launch of the GIG’s second gold trail in Kalgoorlie, with a further 15 points of interest available throughout the region, on the Heart of Gold Australia app – which coincided with the city’s celebration of 125 years since gold was discovered in the region. Hayes went on to announce the expansion of the WA school program, with additional lesson plans created in line with the Australian Curriculum based on the new gold trail. With the Gold Industry Group’s activity and promotion of the industry now thoroughly servicing Western Australia, the focus for new major projects rests on the shoulders of the GIG’s eastern state members and surrounding gold communities who will be integral to the further advancement of the industry’s recognition across the nation. "With the confidence of the industry and the community we will continue to work with our members as the year progresses to plan the development of gold trails on the east coast and expand our schools program throughout Australia," said Richard Hayes. The Minister for Mines and Petroleum, Commerce and Industrial Relations, Electoral Affairs, and Asian Engagement, Hon. Bill Johnston, then shared his views and vision for the future of the gold sector speaking of the increase in gold exploration and State Government funded incentive scheme driving new exploration projects. Minister Johnston also shared his excitement for the launch of Australia's second Heart of Gold Discovery Trail in Kalgoorlie. "I've been visiting Kalgoorlie for 30 years and you can see the enormous impact the gold industry's had in Australia - it's great the trail will stretch to Kalgoorlie," he said. The Gold Industry Group also announced the departure of three of its board members this year Norman Moore, Richard Jones and Sharon Warburton; whilst acknowledging new Director Stuart Tonkin CEO Northern Star Resources, and two new Directors to be appointed at the next Board meeting.